Brookhollow Lane: No Place Like Home! It's nice to be home. We spent the weekend in Arkansas at my Dad's. Also took a side trip to Memphis, which we had never been to. Beale Street is a wild and crazy and fun place. Also visited the Civil Rights Museum while there. Of course we garage saled and hit the jack pot this weekend. 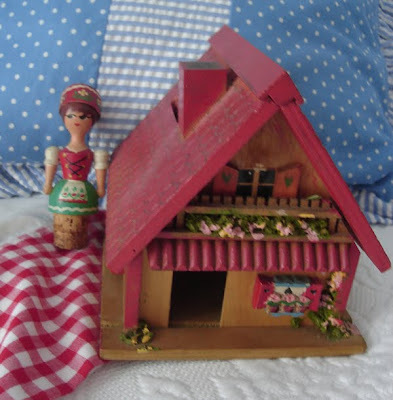 Above is a little German house bank and a German or Swiss bottle stopper. I thought they looked cute together. At an estate sale I found these linens including a Vera dish towel and a towel with the pattern printed on it. I love finding these, because I like to embroider them myself. The orange linen is a table runner with french words going around it. Really cute. 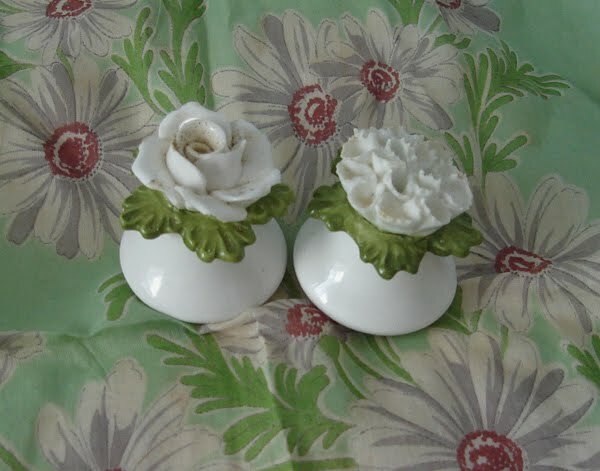 I found the green hankie above for 25 cents and the unique little salt and pepper at a different sale. 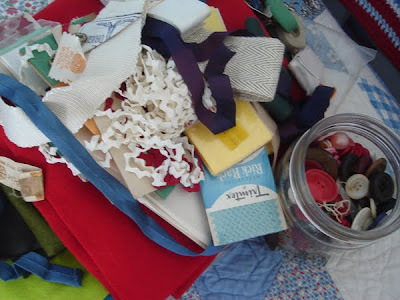 I bought the jar of buttons and bag of rick rack stuff and the lady told me to take whatever sewing stuff I wanted. So I came home with a pile of felt. I love vintage felt, because the texture is different and sometimes you find neat colors. We hit about 7 sales. I love going in a retirement area, because they have different stuff then around my house. Hubby scored a great set of binoculars so he was a happy camper. It was a fun weekend, but it's always great to get back home! It's about 100 degrees here and really humid-stay cool! Hope you all had a great weekend. Sounds like you had a fun weekend. You got some wonderful finds!! 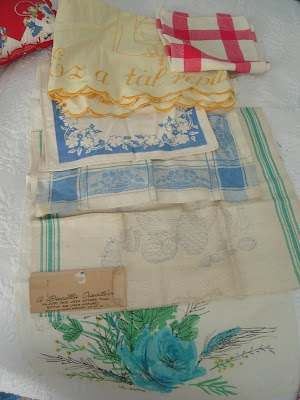 I love old linens and hankies...and sewing stuff too!! Leslie I am home...but being here means that we didn't get to meet!! I am so sorry!! I do love your finds!! Good job. Love all your notions...can't get enough of those things! I didn't know Vera made towels??? I thought scarves were it. Learned something new!